These irresistible Lip Lattes™ and Tea Balms™ are sure to awaken your senses with enticingly delicious aromas! Created with nature’s finest ingredients that will leave your lips super soft, protected and feeling splendid. $2.49 each. From Leeza of New York, New York on 10/27/2017 . 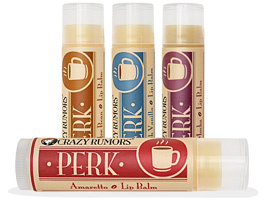 All of the Crazy Rumor Lip Balm flavors are brilliantly conceived and all of them work perfectly. This time I fot Spice Chai and Orange Bergamot. There is, however, no "wrong" choice. You will eventually want to use all of the Crazy Rumors for the fun flavors and for how excellently they work. From Anonymous of Ballico, California on 12/7/2012 . Love the scents, and they slide on smoothly, no stickiness. A+! From T.J. of Rock Springs, Wyoming on 7/8/2012 . I purchased the Apple Spice flavored lip balm, and it's amazing! Don't worry about it being overpowering in taste or smell, because that's not a problem this product has. Better yet, the taste isn't overly sweet like some of those balms for kids are. Further, I never got that weird buildup of slime in the corners of my mouth when using this product. Definitely recommend this (i.e. worth the price). From Anonymous of Jtown, Arkansas on 6/21/2010 . I bought the Orange Bergamot, it has a wonderful smell and it is very moisturizing. I would buy this again. From Sarah Joseph of Columbus, Ohio on 3/10/2010 . The Orange Bergamot flavor tastes exactly like Earl Grey Tea. I'm amazed. In fact, every flavor I've gotten from Crazy Rumors has been amazing. They give you a variety of flavors reminiscent of the LipSmackers I used as a kid, without the crappy petroleum-based ingredients.